You are a seller of Amazon and import products from china, whether you send your product directly to Amazon FBA. Amazon FBA allows sellers to send goods to Amazon warehouse, which will perform your order on your behalf, packaging and distributing the product to Customers. It is a great way to make sure you can sell your products and send them directly to your customers so you don’t have to worry about order fulfillment and after-sales service. Most FBA sellers import goods from china. China is the world’s largest commodity exporter, you can buy all kinds of goods like ALIBABA. As a result, you can find suppliers in china, or directly send the goods directly from the supplier to the customer, or send your products to Amazon fulfillment Center in other countries (such as the UK, USA, Australia or Germany) to start your online sales. Let’s learn more about shipping from China to Amazon Fba. Most people know Amazon FBA. When customers browse Amazon’s product pages, Amazon emphasizes “Fulfilled by Amazon”, which means that the product contains Amazon’s fulfillment Services. More and more customers favor the merchandises with the Amazon fulfillment service. As you already know, most of the users prefer products with “Fulfilled by Amazon”. This is especially important during the shopping season, where almost all retail sales are growing, you get better sales. While in the busy shipping season, a surge of orders is a good test for your delivery service, as any shipping delay in order can lead to unpleasant customer. Before Christmas sales season, send your product to Amazon and avoid festive shipping. You spend less time on customer service, FBA service will do this for your Buyers. This means Amazon customer service will help your buyers solve any order Problems. You no longer need to face after-sales service, you will save a lot of Time. So you have more time to run your Amazon store: find better products and suppliers, optimize your storefront, improve conversion rates, You can implement more operational strategies! You’ve learned that Amazon’s fulfillment services can give you an edge! Now you need to send your goods/inventory to Amazon Warehouse. Get all your inventory to Amazon and boost your sale. Before shipping to Amazon FBA, It is recommended that you understand how to control processes and extensions to make sure that it is the right choice for you. Amazon Seller account management center, convert merchandise to FBA inventory, and delivery plan. Print shipment label, paste them on the packages. You must follow the Amazon Rules. You need to know that Amazon has strict requirements for the appearance of a product and rejects defective products. Before shipment, the seller must check the appearance of each package to ensure that there is no apparent damage or Distortion. 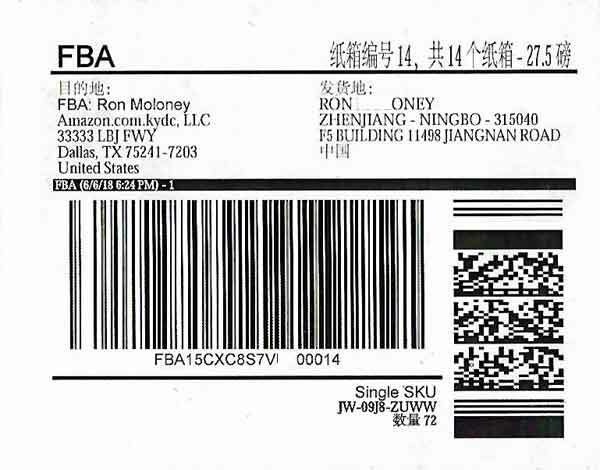 If so, you must open the outer packaging to check the integrity of fba shipments. If there is damage to the port of shipment, there is no doubt that Amazon will refuse to accept Them. The seller must prepare the goods according to Amazon’s Instructions. If you do the wrong action, Amazon employees may process your inventory, resulting in a loss of money. Properly transporting FBA inventory helps you save time and money and avoid unnecessary hassles. You have already made the goods ready and now you need to send the goods to Amazon Warehouse. After years of development, there has developed two mature methods of shipping from China to Amazon. Air Freight. It is undoubtedly the quickest way to ship to Amazon Warehouse. By its timeliness, it can move and place goods within a short time, so you can replenish Amazon’s inventory faster. Sea Freight. If your business needs to transport a lot of cargo to Amazon warehouse, you may need to sea freight. It is suitable for large-volume shipping to save the international freight cost. But its only drawback is that it will take a long time. Generally, air freight and sea freight only provides “port-to-port” services. What about the way from the airport or port to FBA Warehouse? The above two modes of shipping are “door to door” concept, which will integrates air or sea transport, customs clearance and second length shipping to form a whole service. It is established for cross-border e-commerce, especially for Amazon Sellers who need to ship to Amazon for FBA. Besides, both of them are DDP terms, which means that the shipping costs you pay have include import duties and customs clearance fee. It is important because Amazon will not be a direct recipient and not responsible for customs clearance and tariffs on your goods.